There’s an abundance of information available for high-performing athletes on how to eat, what to eat and when to eat. However, the research and expert advice is often conflicting: eat fat, don’t eat fat, cut out carbs, carbo-load…and the list goes on. So how do we begin to decipher it when we need good triathlon nutrition? On my personal journey as a triathlete, I’ve had to experiment and find what works for me. With food allergies, I couldn’t just jump on a trend bandwagon because I could get sick from it. So I tried combinations of bars, gels, chews and powder mixes to find what works and doesn’t work for me. And, as it is with anything in life, we are all different. 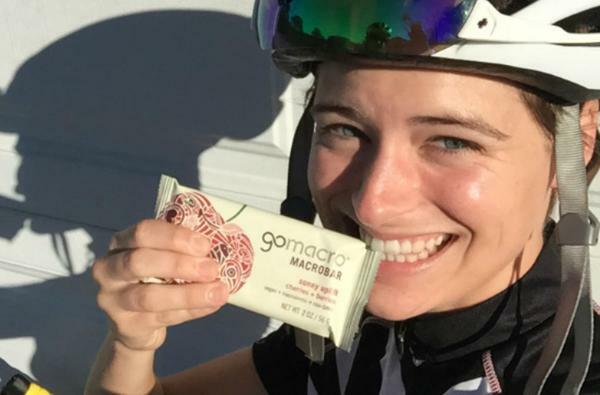 Last Spring I had the privilege to sample GoMacro MacroBars to the triathletes at the IRONMAN 70.3 California expo and found that many athletes also have their own unique way of finding the right products and foods for fuel. Here is what I found. Disclaimer: This is by no means a scientific study, just observations and trial-and-error tips from triathletes and my own personal knowledge of nutrition. 1.Real food with easy access. I often hear triathletes resorting to making their own food for training and racing because they’ve been unable to find a clean, whole food bar for their training. Many athletes have jobs and families and no time to create a bar or cook. Plus, when you’re on the bike, home-cooked portables can become pretty messy. GoMacro provides triathletes with on-the-go fuel that is also clean and of the highest quality. Got GI issues? Every triathlete will experience GI issues at some point–whether you didn’t have time to buy any nutrition so you ate a brownie, or you tried a new product claiming to be all-natural even though the nutrition facts are unrecognizable. GoMacro’s whole food ingredient list is all real food. Cashews, carob, puffed brown rice, cherries, etc. You’ll be sure to see the ingredients that are in the bar, too. However, these ingredients also digest easily. They are what our bodies were intended to digest. Plant-based and natural. 3.Variety of flavors and textures. When a triathlete finds a bar he/she likes, it’s great until you get bored and want something of a different consistency. GoMacro addressed that issue right off the bat and has provided us with 11 different MacroBars to choose from. Have you tried a variety of MacroBars? They have different textures and consistencies: cherries + berries is grainy and chunky, while the banana + almond butter is smooth and chewy. Why? Because the ingredients vary from bar to bar. GoMacro knows that everyone is different and has different taste preferences, metabolisms and digestion issues. The variety of ingredients and textures accommodates where no other bar does. From nut lovers to nut allergies, there’s a bar for everyone. All of the above reasons are fine and dandy, but the real issue is the taste. GoMacro MacroBars taste great and you never have to wonder what it is going to taste like. cherries + berries has actual cherries, berries and gluten-free oats. Peanut butter has actual peanuts and peanut butter. Try one and see for yourself. Within the endurance world, sports nutrition is key. An athlete needs different fuel depending on timing. Are you about to head out for a run? Are you in the middle of a sufferfest on the bike? Or are you relaxing with your feet up after a race? GoMacro MacroBars provide key ingredients and nutrition profiles that target pre-, mid- and post-workout. For pre-workout or pre-race fuel, you want to prepare your body for the work ahead. Quick (but healthy) energy and fast digesting nutrients are key. Because of this, carbs and sugars are what you need. Not to worry, the natural sugars and infant-safe brown rice syrup found in GoMacro MacroBars are packed with sustained energy – meaning you won’t crash an hour into your workout. All of our bars also contain protein, which, in small amounts, will only contribute to the sustained energy you need for your workout or race. For mid-ride fuel,sugars and carbs play the main role for a similar reason as the pre-nutrition: energy. However, you also will need something that digests easily. This is where MacroBars excel. Made with high-quality, whole food ingredients that are also plant-based, GoMacro MacroBars are extremely easy to digest. For post-workout or post-race recovery, you need to replenish those achy muscles with a combination of sugar and protein. Sugars help transport the protein to your muscles quickly and efficiently. Ever heard of glycogen stores? These get depleted after a exercising, and the only way to replenish them is to take in sugar and protein. However, not all sugar is created equal, and many sports nutritionists call on the almighty glucose to the rescue your muscles. GoMacro MacroBars use infant-safe organic brown rice syrup that is entirely made up of glucose. All of the high-protein GoMacro flavors support recovery with a complete plant-based protein blend of brown rice protein and pea protein. Payton Douglas, 22, grew up with a love for outdoors and anything that pushed her limits. Growing up with epilepsy, she decided that exercise and nutrition were important aspects of her life that she could control. With that in mind, she embarked on a journey after high school to become an IRONMAN. Although she has yet to complete a 140.6, she races in several 70.3s each year and has also been seizure-free since her first year of triathlons in 2013. Today, her life and occupation still revolves around her two passions of sports and nutrition. As GoMacro’s Sports and Wellness Manager, she is able to educate others about fueling their body with the right ingredients in order to perform their best in any athletic endeavor.